Close up of hand painted white lettering and custom sewn appliqué. Sewing appliqué on industrial fabric with a walking foot machine. After about eight years without a proper sign outside the last two shops, I finally listened to the pleas of my lost customers. Now it will be a lot harder to miss the shop. This banner sign came out fantastic. The white lettering is hand painted and took quite a while to paint it on the Sunbrella fabric. The logo badge and black lettering is all appliqué. The lettering was stitched one stitch at a time. When you see the stitching from up close you can appreciate the work that went into making it and the quality it represents. 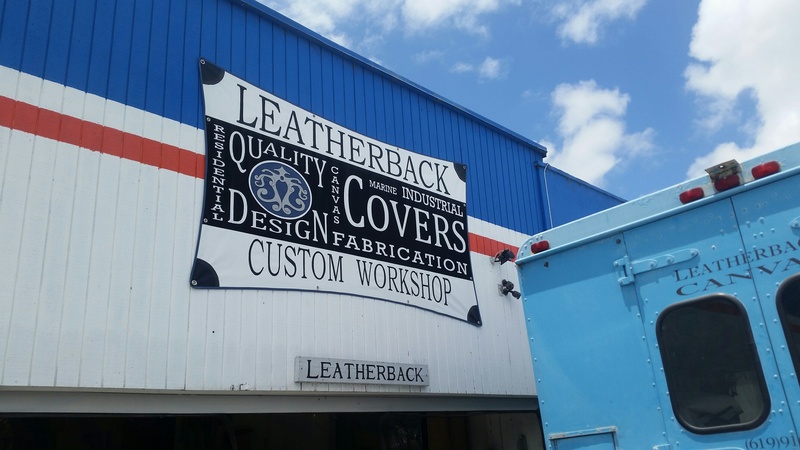 This banner will last a really long time because it is made with the highest quality marine grade materials. If you would like to make a banner for your business or some other decorative use contact us. This is a great alternative to a cheap vinyl banner for a spot where the customer will be close enough to see the stitching..